Backs Marrero over Kyle in primary race and vows to give GOP's Flinn "his worst defeat ." 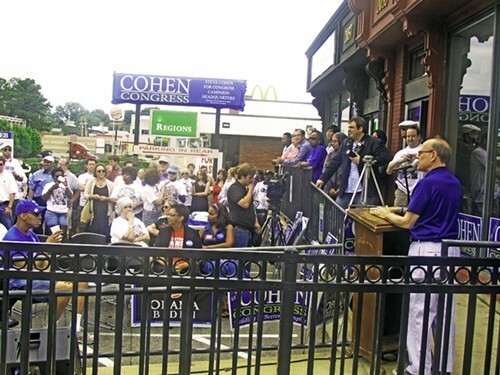 Formally opening his newest campaign headquarters on Union Avenue Saturday, 9th District congressman Steve Cohen cast himself not only as a candidate for reelection but, in both subtle and overt ways, as an organizing figure in local Democratic politics. “We want to have a ballot this year that takes the best people into office,” said Cohen in words that echoed the longtime practice of one of his predecessors, former congressman Harold Ford Sr., who published sample ballots at election time indicating his preferences for various positions. In the manner of the senior congressman Ford, Cohen indicated he would not shy away from taking sides in a Democratic primary, and he did just that with respect to the race between his longtime friend and ally, state Senator Beverly Marrero, and another incumbent Democratic senator, Jim Kyle, currently the leader of the state Senate’s Democrats. Staying with that theme, Cohen in effect continued to lay claim to those East Memphis portions of his district which were reassigned by the legislature’s Republican majority to the 8th District, where GOP congressman Stephen Fincher now holds sway. Of his own reelection campaign, in which he has Tomeka Hart as a Democratic primary opponent, Cohen focused on the likely Republican nominee in the 9th District race, former Shelby County Commissioner George Flinn, the wealthy radiologist and broadcast magnate who, as Cohen noted, has waged unsuccessful races in the past for county mayor, City Council, and Congress. Noting that suburban referenda for municipal school districts will occur on August 2 and draw out Republicans, Cohen also urged his listeners to come to the support of countywide Democratic candidates Ed Stanton and Cheyenne Johnson, who are running to continue as General Sessions Clerk and Assessor, respectively. And Cohen looked beyond the races on the local ballot. Referring to a recent Department of Justice study showing a variety of problems at Juvenile Court, Cohen conferred a plug on Veronica Coleman, a onetime candidate for Juvenile Court Clerk, as someone who could help remedy the situation there. He said, too, that, despite having the burden of reelection himself, he was “still going to do national campaign work for president Obama,” and he viewed with concern the prospect that a President Mitt Romney could make appointments to the Supreme Court.